Have great events or promotions and want them to be widely attended? 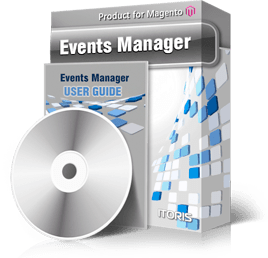 It’s now easy with Magento Events Manager. Provide your site visitors and customers with a nice calendar on a separate page. Your events will be mappend on it and easily found. Users can switch between calendar views - month, week, or the day view. Clicking on an event will bring the full event details. Events may have normal or high priority. The events search is available. Your customers will be able to easily find what they look for. All events have unique SEO URLs for search engines to index. You can choose either the 12 or 24 hour format to use for events, either week starts on Sunday or Monday. The event details are edited using WYSIWYG, widgets are allowed. You can create special events for certain customer groups or store views. In addition, insert a special side block for your customers to see all your upcoming events on every page.